Thank you to everyone who has joined us so far! We are now a formal entity which allows us to apply for grants, as such we are required to have a membership list. Having a membership also increases our influence when meeting people such as Council officials, as it shows that we are representing a larger group of people. Assist Abbotts Barton residents in finding out about any local issues that might affect us. 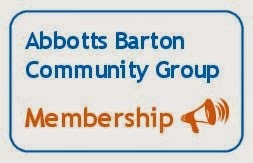 Help Abbotts Barton residents get involved in the local community. Find out how we can make where we live even better – and do something about it! We would like the members of the group to support us in achieving these aims. This would usually be by receiving our communications (either online via website subscription, Facebook, Twitter, or simply by checking the noticeboard) as well as letting us know your opinions about local issues and the direction of the group. There will also be community events, including an AGM. If you are currently receiving the automated emails from our website we would like to count you as a ‘member’; please let us know if you would rather not be counted as one (you can do that by sending us a short message via the Contact tab of this website, there is no need to unsubscribe from the site). Membership is free. In addition to being a member you could become a ‘street champion’: this would involve promoting events in your street (or nearby) by, for example, delivering leaflets a few times a year. Please do get in touch if this is something you would like to do. We would be interested in any feedback you have about membership or other aspects of the group. And of course, we would welcome anybody who would like to become a new member of the group! If you would like to do so, simply enter your email address into the Subscription box on the Contact tab. Thank you!